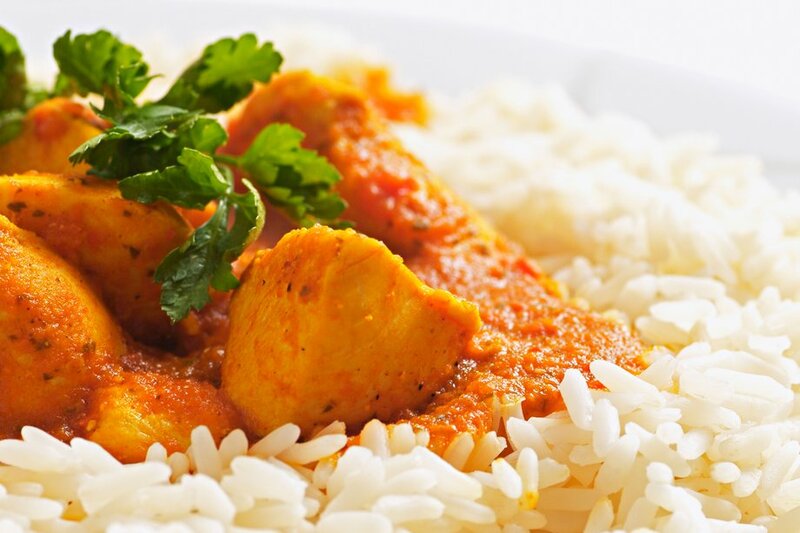 Spice up your mealtime with this simple and tasty chicken curry dish. It's a family favourite – just be aware that this recipe is medium fat rather than low fat. Heat the oil and fry the onions until soft. Add garlic, tomato, tomato purée, chopped chilli and spices. Cook for a few minutes and then add 2 tablespoons of water and allow to reduce. Add chicken and cook for 10 to 15 minutes on a medium heat, then add the yoghurt, stirring slowly. Season with black pepper and simmer for a further 5 to 10 minutes. Meanwhile, cook the rice following the packet instructions and boil or steam the cauliflower until tender. Garnish the curry with ginger and coriander. Serve with rice and cauliflower. These figures apply for 180g of cooked basmati rice and 80g cauliflower per portion.